Liquefied gas cargoes are measured and calculated in a similar manner to that of other bulk liquid cargoes such as crude oils and petroleum products. However, as liquefied gases are carried as boiling liquids in a closed containment system the quantity of vapour has also to be measured when calculating the total quantity onboard. 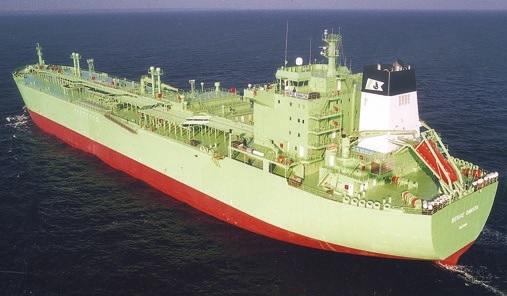 It is common practice for gas tankers on a regular trade to retain onboard a quantity of liquid (heel) in order to keep tanks cool on the ballast passage. In this way the vessel arrives at the load port ready to commence loading with no cool down time necessary. At the load port the new cargo is added to the heel. Equally if the ship has arrived with uncooled tanks a quantity is usually put onboard for tank cool down purposes. It is therefore extremely important that a full survey of all tanks is carried out before and after every operation. Cargo being loaded may arrive at the manifold at various temperatures during loading. This may be due to cargo being taken from different shore tanks or the initial cooling of ship/shore lines. It is possible that because of this some stratification in the vessel’s tanks can occur. It is very important therefore that temperatures are taken at all available points in order to accurately assess the actual average liquid temperature. Ships temperature sensors are usually provided at a number of different levels. This is equally important for vapour temperature where temperatures in the tank dome are usually higher than that of the vapour near the surface of the liquid. The positions of temperature probes must be accurately known in order that only those actually submerged in the liquid are used for liquid temperature and similarly for vapour temperature. Density is by definition measured in vacuum at 15°C. Density x volume M3 (at 15°C gives metric tonnes in vacuum). The measurement of liquid gas density requires laboratory facilities or equipment not available on ships. Modern terminals usually calculate this form from an analysis of liquid composition obtained from a gas liquid chromatograph. The results of this are provided to the ship in order to carry out the cargo calculations. It is necessary to correct the density for the actual observed temperature of the cargo. For specialised chemical gases, the storage facility normally provides their own density table for the cargo showing the density for a range of temperatures. Some ports provide the density at a standard temperature of 60°F or 15°C. This has to be corrected to the density for the observed cargo temperature. Density can be quoted as either being in air or in vacuum. For a density quoted in vacuum subtract 0.0011 to obtain the density in air, i.e. 0.5074 in vacuum corresponds to a density of 0.5063 in air. Cargo's quantities worked out in vacuum are always heavier than those worked out in air. Liquid gas quantification is more commonly expressed in terms of weight in air and indeed this is a requirement of most customs authorities. It is extremely important that when a density is provided to the vessel it is ascertained whether the density is in air or vacuum. The liquid level is read direct from the tank level gauge on the tank dome. The remote readout must not be used for cargo calculations. It is necessary to apply corrections to this figure before entering the tables. These corrections are for tape shrinkage and float immersion. The float gauge tape passes through the cold vapour space and depending on the space temperature contracts thus indicating a higher liquid level than actually present. Float immersion will depend on the density of the cargo and this will usually be different from the manufacturer’s initial determination. A small correction is necessary for both these items to obtain the correct gauge reading before entering the tables. All ships are provided with a calibration table for each tank by means of which the tank’s liquid (and vapour) volume can be calculated from the measurement of the liquid level. These tables are obtained from careful measurement of the tanks during the ship’s construction. These tables normally refer to an upright vessel with no list. Corrections are therefore necessary for trim and list and these will be included with the tank calibration tables. Instruction for use will be included with the tables. The cargo tank volume will have been calculated at ambient temperature and the tables calculated for a standard temperature of say 20°C. Cold cargo temperature will result in tank shrinkage and a reduction in volume. A correction therefore is necessary and this is normally expressed as the Tank Shrinkage factor. The volume of vapour is found by subtracting the volume of liquid from the tanks 100% capacity. This is at the calibration temperature for the tank before the Volume Correction Factor has been applied. It is necessary to apply a Volume Correction Factor (tank shrinkage factor) to this figure and this correction is obtained using the average vapour temperature. On completion of measurement calculation of the total cargo quantity can be carried out. There is no internationally agreed standard for gas cargo calculations and procedures can vary particularly with the chemical gases. In the absence of any instructions concerning calculations the following procedure using the standard temperature of 15°C which is widely used should be followed. The co-mingling operation can also cause “apparent” losses, as the density of the mixture will not be a mathematical average of the densities of the components as the molecular component is different. Calculation of cargo densities in such circumstances is discussed in Appendices 3 & 4 of the SIGTTO publication “Quantity Calculations for LPG and Chemical Gases”. Copies are available direct from SIGTTO. Determine by measurement the average liquid and vapour space temperature (degrees C) and the vapour space pressure (barg or mbarg). Read the tank liquid level and calculate the liquid volume (V1) at tank conditions using the ship’s calibration tables for that tank and making all necessary corrections for temperatures, list and trim. Determine the liquid density noting the temperature at which it is determined and using ASTM* table 53 convert this to liquid density at 15°C. Using the liquid density at 15°C and the measured average liquid temperature, enter ASTM* table 54 to derive the appropriate volume correction factor to convert to the volume at 15°C. Calculate the liquid mass. Volume x Density. Calculate the vapour volume at tank conditions by subtracting the apparent liquid volume (liquid quantity before applying tank shrinkage factor) from the tank total volume. N.B. ASTM tables 53 & 54 have been revised for densities in the range 610.0 to 1076.0 kg/m3 however below this range covering LPG no revision has been carried out and ASTM-IP tables 53 & 54 are to be used. Using the average vapour temperature correct the apparent volume of vapour for tank shrinkage. I is ideal gaseous molar volume at standard temperature (288K) and standard pressure (1.013 bar). This is 23.645 m³ / Kmo1). Calculate the vapour mass by multiplying vapour volume and vapour density. Add the liquid mass and the vapour mass to give the total cargo mass in the tank. Convert the total to weight in air.